I don’t know about you, but I’ve logged a lot of hours singing in the shower (just ask my husband or my chihuahua) – there’s just something about the great tile acoustics that brings out my inner Mariah Carey. I soon realized that the volume level on my iPhone just wasn’t cutting it (and I was killing my battery), so I did a ton of research on a Bluetooth shower speaker that would take my shower performances to a whole new level. 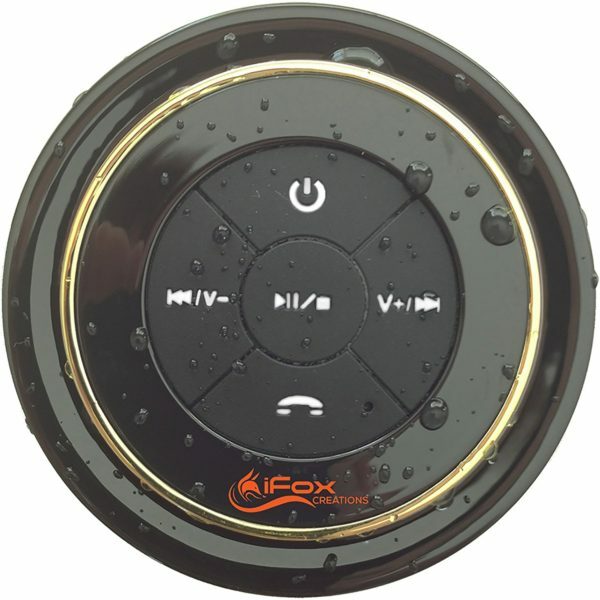 After trying out several different speakers that just didn’t hit the mark, I found a clear winner – the iFox iF012 shower speaker. The shower speaker combines awesomely loud audio with long battery life. Voila! I can now hear my jams over the water pouring from the showerhead. Want to liven up your listening (and singing) experience in the shower? The market is flooded with options when it comes to choosing a Bluetooth shower speaker, but that’s why I’m here to help you break it all down. Let’s get into my picks for the ultimate Bluetooth shower speakers. 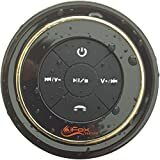 The iFox iF012 Bluetooth Shower Speaker changed the game for me, and it’s my pick for the best shower speaker on the market. What is the most important feature of any speaker? Sound (obviously). The iFox iF012 delivers on this front with crisp, clear audio – and this bad boy gets loud! Seriously, the volume is fantastic and easy to hear over a showerhead at full blast, even when I’m washing my hair. If you crank the volume all the way up, the sound may get a little scratchy (as most small speakers do). However, you shouldn’t need to max it out to get plenty of volume. The battery life is amazing. You can rock out on for up to 10 hours of continuous playtime. When your battery does eventually go dead, the speaker fully recharges in under 3 hours. 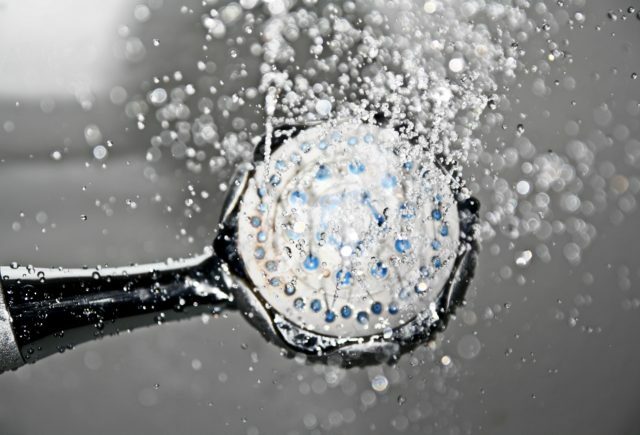 While the sound is the most important feature for any speaker in general, water-resistance is the most important feature for a shower speaker specifically. The iFox iF012 excels here as well. It is 100 percent waterproof and the company boasts that you can fully submerge it up to 3 feet without issue. In fact, iFox offers a one-year warranty to guarantee how awesome their product is. It’s black, it’s round, and it’s compact. I’m a minimalist when it comes to style, so I do like the basic black look. But the overall appearance of this speaker isn’t my favorite. I’ll talk more about this later. The importance of a good suction cup is underrated. The first two speakers I tried (which shall remain nameless) fell off the shower wall more times than I can count. I really wanted something that stayed. Well, the iFox iF012 does just that. It’s been placed on to the shower wall and it’s not budging! Syncing the speaker to your phone is quick and easy. I haven’t timed it, but according to the company, it takes only 6 seconds once you hit the power button. The Bluetooth range is powerful as well – your shower speaker will stay connected from up to 33 feet away. The buttons and controls on this shower speaker are simple and user-friendly. You can turn up the volume, skips songs, and press pause, all from the speaker. Need to answer a phone call in the shower? You can do that, too. 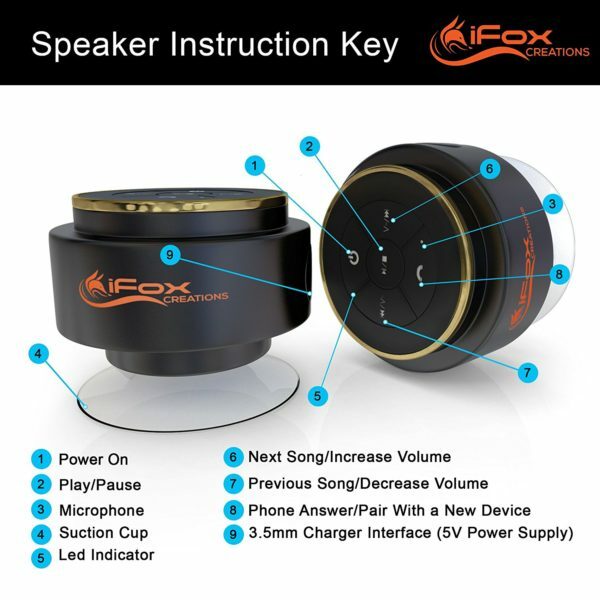 The iFox iF012 has a built-in microphone. While I’ve never used this feature, it’s nice to have in case of emergencies or when you want to catch up while chilling in the tub. You can also use the microphone to chat with Siri during your shower if that’s your thing. The iFox iF012 does have some flaws (but not deal breakers). It’s not the most modern looking shower speaker out there. It is a bit bulky and sticks out from the wall more than some other options. But don’t be scared off by the word “bulky” – we’re talking less than an inch difference here. Also, do note that the USB charger isn’t the standard size that many manufacturers use. For that reason, don’t lose the charging cord! Overall, this little shower speaker makes a big splash. It delivers on sound, it doesn’t move around, and it has a great battery life. I can’t recommend it enough. This is an attractive, rugged speaker that looks like it means business. 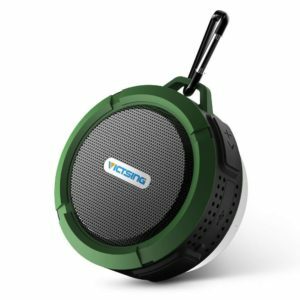 The outer case of the VicTsing Shower Speaker is made from silicone, which makes it dustproof and durable if it takes a tumble. The sound is truly top-notch on this speaker. With a 5W speaker, it blasts out crystal clear stereo sound. You can really crank up the volume as well, with very minimal distortion in the sound. The VicTsing even boasts some solid bass, which is rare in any small speaker. The battery life isn’t great. You get 6 hours of playing time between charges – and that’s only if you keep the volume at 70 percent of maximum volume. The VicTsing is waterproof but not submersible. Don’t drop it all the way down in the water or it’s done for. As I mentioned, this speaker looks rugged and cool. There are a few different colors to choose from, including a dark gray (which is great if you’re like me and color just isn’t your thing). The VicTsing has user-friendly controls and good functionality. 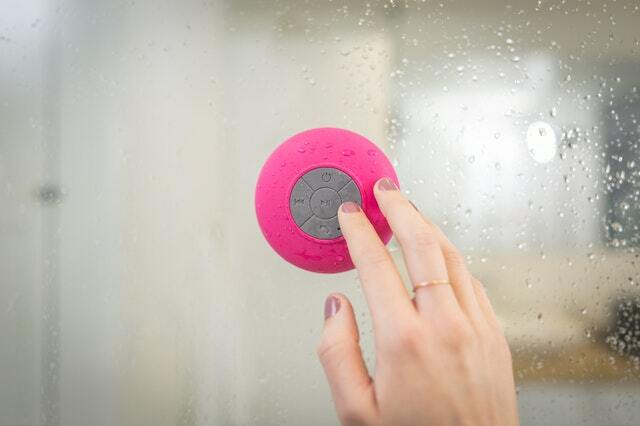 This is another speaker that lets you take phone calls in the shower. You can even redial a number or reject calls if you’re mid-song when the phone rings. Included with this shower speaker are a detachable suction cup and a clip in case if you want to hang it somewhere. I’m not sure what you would hang it from in the shower, but it’s a cool feature if you take your speaker on the go. For me, the biggest flaw in the VicTsing is that it’s not submersible. If you want to use it next to a hot tub, pool, or bathtub, use caution. The battery life (around 6 hours) isn’t this speaker’s strong suit. I like my music loud, and I like my showers long, so this is a concern for me. While my showers aren’t 6 hours long, remembering to recharge several times a month is a hassle. Overall, this speaker offers a good range of features and awesome audio quality, all in an attractive package. It’s a solid second choice. 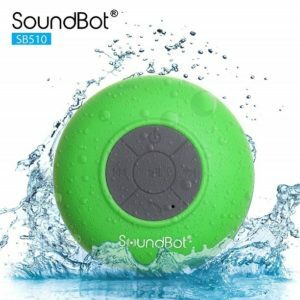 If you’re looking to dip your toe into the shower speaker scene but don’t want to spend a lot of money, then the SoundBot SB510 is the best shower speaker for you. It features a lot of value and functionality in a compact shower speaker, all at a low price. For the size and the price, this shower speaker packs a decent punch when it comes to audio quality. You get a good range of sound, and the volume is decently loud. The SoundBot doesn’t have the best battery life (6 hours tops). You will want to keep your charger handy with this one. Take it in the shower, but don’t give it a bath. This speaker is water-resistant but not waterproof, so don’t drop it down in the water. The SoundBot comes in 6 colors, but personally, I love the white and black options. They give it a more sleek, expensive look. But if you have kids (or you’re a kid at heart), the bright neon colors are fun. This speaker is very compact and has a nice, rubbery feel that’s easy to grip and easy to clean. All the controls are user-friendly. Plus, it has a microphone for those shower phone calls everyone seems to be taking. The company offers a 100% risk-free warranty for one year. That’s a pretty sweet deal if you’re on the fence about purchasing a budget speaker. Water-resistant? Yes. Waterproof? Nope. The SoundBot is fine in the shower of course, or even outside on a rainy day – just don’t submerge it. The company claims the battery life is about 6 hours, but it seems a lot shorter than that. Depending on your volume level, you’re probably looking at a battery life of just a few hours at most. So be prepared to recharge regularly. For the price, you can’t go wrong with a SoundBot, especially if you’re a newbie to the shower speaker scene. Ready to upgrade? The Ultimate Ears Wonderboom is my pick for those looking to spend the big bucks on a quality shower speaker for concert worthy performances. Let’s start with the audio details. The sound is unbeatable, crisp and clear with plenty of bass, and the volume cranks up loud. Because of its shape, you get 360 degrees of sound. If you want true stereo surround sound, you can wirelessly connect two Wonderbooms – now that’s a party! Battery life on this speaker scores an A+. You get 10 hours of non-stop entertainment on a single charge, and the recharge time is just under 3 hours. The Wonderboom is also waterproof. You can fully submerge it for up to 30 minutes, and it will come out still booming away. I love the look of this one! It’s a compact, clean speaker that looks like a piece of art. It comes in lots of different color combinations – there are even some “limited edition” colors if you’re really feeling fancy. It also has a small little loop at the top in case you decide to take your speaker out of the shower and into the world. Here’s my favorite feature – this speaker floats. It’s sure to be the life of your next pool party. Plus, your Bluetooth connection stays strong up to 100 feet away. Unfortunately, that super cool looking design that I love makes it hard to clean. All the little holes of the speaker are a great place to grow shower scum. Since it’s ultra-waterproof, you can rinse it off, but it still has some hard to reach places. Also, there’s no suction cup on this shower speaker. So you’ll need a place to set it in the shower, or possibly use that tiny loop to attach it somewhere. 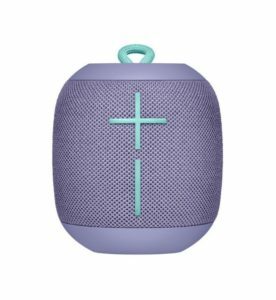 Ultimate Ears makes several different Bluetooth shower speakers, but the Wonderboom is my favorite from the company. Not only does it have all the features you could want, it just looks cool. I’ve covered all these basics in the reviews for my top picks, but here’s a more in-depth look at the factors I considered in narrowing down my favorites. Sound – that is the primary function of any speaker, waterproof or otherwise. For quality sound in the shower, you want a speaker with a big volume boost, or else you won’t be able to carry a tune while washing your hair. But just because it’s loud doesn’t mean it’s high-quality sound. Some speakers produce scratchy sound when the volume is cranked up. When browsing through speaker options, make sure the audio quality is excellent even at high volumes. Keep in mind that shower speakers are small, and small speakers don’t offer the same premium sound you get from a larger sound system. But that doesn’t mean you can’t get musical greatness from a shower speaker. So be picky! Do you want to be able to play your playlist on loop for hours? While you’re (hopefully) not taking showers that last for hours, you still may not want to keep up with recharging your shower speaker’s battery all the time. If you plan on taking your speaker out to a pool party or to the beach, battery life is definitely important. Consider the battery life each shower speaker will offer. Typically, you want at least 6-8 hours of high-volume power before you need to plug your speaker in for a charge. All shower speakers are at a minimum water-resistant. What does that mean? You can splash some water on them, and they’ll continue booming along. But not all shower speakers are waterproof. If you plan on using your shower speaker tubside or poolside, you may want to invest in a fully waterproof speaker that can be submerged in the water without damaging it. This is really just a matter of taste. Personally, I like my shower speaker to be modern and sleek – no bright colors for me. Most of the speakers on the market will be relatively small, although size does vary slightly. But the overall appearance does vary a lot! There are square speakers, round speakers, neon speakers, neutral speakers – you get the idea. Take into consideration your style and preferences to help you narrow down and choose the right look for you. Don’t get overwhelmed by all the options on the market when it comes to Bluetooth shower speakers. You’ve now seen the best of the best (including my top pick, the iFox), and you’re ready to rock and roll. These speakers are made for splashing and will keep you singing in the shower for hours on end (my apologies to your family). If you’re looking for a complete surround sound system for your home, check out this article on surround sound systems. Need an outdoor speaker system to amp up your barbecues? We’ve got that covered, too! Q: How do I pair my Bluetooth shower speaker to my phone? A: Most shower speakers make it easy to wirelessly connect to your phone. They will usually include brief step-by-step instructions. In general, you’ll want to turn on the speaker and then go to your phone’s Bluetooth settings. If your phone’s Bluetooth is switched on, it should search and find the shower speaker. Then just click and pair the two together, and you’re ready to rock! Q: Can I pair my Bluetooth shower speaker with Alexa or Google Home? A: Yes, most Bluetooth shower speakers on the market today will connect to any of your smart virtual assistants. Q: How do I extend the life of my Bluetooth shower speaker? A: Try not to drop it, for starters. But most importantly, you’ll want to keep it clean and dust-free. As with any speaker, dust can ruin the sound quality – so can shower scum and build-up. You can use a can of air to blow off excess dust or wipe with a damp microfiber cloth for grimier build-up. But don’t use any harsh chemicals! They can damage your speaker. Q: Where else can I use my shower speaker? A: The possibilities are endless! Here are a few ideas. Is your car radio on the fritz? Rock out in your car with your Bluetooth speaker stuck to the window. If you’re heading to the lake, bring the jams onboard for a boat party. In the mood for relaxation? Hot tub and chill with easy-listening tunes from your waterproof speaker. Shower speakers are super portable, so enhance your life with great music wherever you go! This entry was posted in In Depth Product Reviews, Uncategorized and tagged shower speaker. Bookmark the permalink.